If you’re building a new residence in the Innisfil area, or if your current home is in need of a new roof, give us a call at Slippery Slope Roofing. There are a number of different options when it comes to roofing materials for both residential and commercial properties, but the most popular by far is shingle roofing. Shingles are durable, economical, and easier to install than other types, which helps to make the installation process less expensive, as well. Most shingles available today are also fire-resistant and weatherproof, allowing them to withstand all types of climate conditions without cracking or pulling away from the roof. With a variety of colours and styles available, you can also choose shingles that complement the style and appearance of your home. Your roof serves to protect the inside of your home or office building during rainstorms, snowstorms, and heavy winds. It also helps keep the sun’s harsh rays out of your building, which can cause severe damage, as well as insects, spiders, and wild animals that might try to come into your house. With proper waterproofing, the roof also helps to keep excess moisture from seeping through the roof and destroying your possessions. If you’re building a new residence in the Innisfil, Ontario area, or if your current home is in need of a new roof, give us a call at Slippery Slope Roofing. 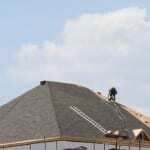 Our owner and foreman have 50 years of combined experience in both residential and commercial roofing. Something that sets us apart from other roofing companies in the area is our dedication to our clients. In fact, we don’t take on more than one job at a time. We’ll finish your roofing repair, installation, or replacement project before moving on to the next job site, allowing us to focus completely on you. Call us today to get started!